Sprint and Tidal announced today in a joint press release that the cellular provider has bought a 33% stake in Jay Z's streaming service. It is an interesting marriage, considering that both are industries in which competition is wanted, consumers fear consolidation, and the companies are far behind the market leaders in terms of subscriber counts. Jay Z and the so-called "artist-owners" will still be running the day-to-day operations at Tidal, though Sprint's CEO Marcelo Claure will join Tidal's Board of Directors. This announcement comes just a couple days after an embarrassing report claiming Tidal had been vastly overstating its subscriber counts. According to company documents obtained by Norwegian newspaper Dagens Næringsliv, when Tidal claimed it had reached the 1 million subscriber mark in September 2015, the true number was just 350,000. When Tidal told the press it had 3 million subscribers in March 2016, it had 850,000 paying subscribers, according to the report. Tidal's ownership group claims that the former owners misrepresented Tidal's number of subscribers when Jay Z and company decided to buy the company, but hasn't provided explanations for the recent reports. The exclusive release of Beyonce's Lemonade boosted the subscriber base after its Tidal-exclusive release in April 2016, but the Dagens Næringsliv report alleges it has been sinking in the months since, down to 1.1 million in October 2016. Even taking Tidal's subscriber counts at face value, it lags far behind Spotify and Apple Music. Sprint isn't exactly bursting at the seams by most industry metrics, but is in a relatively better position. It has fallen to fourth place out of the four major carriers, but has beaten the likes of AT&T in new postpaid subscriber adds in the recent past. Their new ad campaign has ceded the popular argument that carriers like to make—that their coverage is the best—and instead focuses on other customer benefits. While sparse on details, today's announcement promises that Sprint customers will get benefits from Tidal. It suggests there will not be a free subscription, but it teases at discounts or otherwise special pricing packages. A more concrete promise is exclusive audio and video content on Tidal that is set aside exclusively for Sprint subscribers. 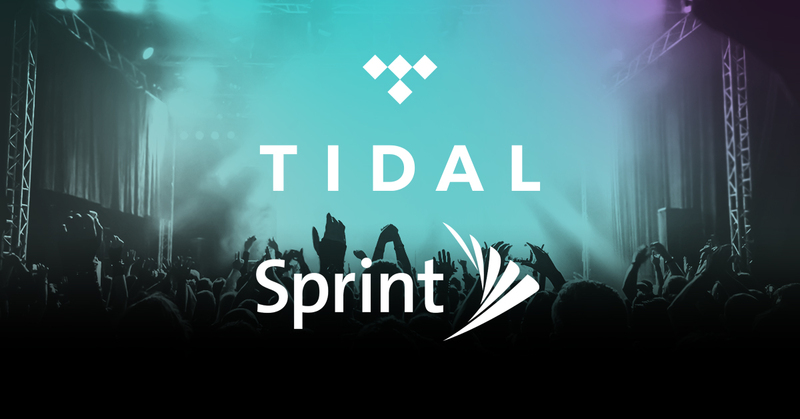 TIDAL and its artists will make exclusive content that will only be available to current and new Sprint customers. TIDAL is a global, experiential, entertainment platform built for fans, directly from artists around the world. Members of TIDAL enjoy unmatched exclusively curated content that directly connect artists with their fans in multiple ways. TIDAL is available in more than 52 countries, with a more than 42.5 million song catalog and 140,000 high-quality videos. The innovative TIDAL platform, combined with Sprint’s award-winning reliable network and best value for unlimited data, talk and text, will deliver a first-of-its-kind experience for music fans. Sprint’s dedication to its customers and to artists is at the heart of the partnership. Part of that effort will include the establishment of a dedicated marketing fund specifically for artists. The fund will allow artists the flexibility to create and share their work with and for their fans. Sprint (NYSE: S) is a communications services company that creates more and better ways to connect its customers to the things they care about most. Sprint served 60.2 million connections as of September 30, 2016, and is widely recognized for developing, engineering and deploying innovative technologies, including the first wireless 4G service from a national carrier in the United States; leading no-contract brands including Virgin Mobile USA, Boost Mobile, and Assurance Wireless; instant national and international push-to-talk capabilities; and a global Tier 1 Internet backbone. Sprint has been named to the Dow Jones Sustainability Index (DJSI) North America for the past five years. You can learn more and visit Sprint at www.sprint.com or www.facebook.com/sprint and www.twitter.com/sprint. This news release includes “forward-looking statements” within the meaning of the securities laws. The statements in this news release regarding Sprint Corporation’s current expectations and beliefs as well as other statements about the partnership with TIDAL that are not historical facts are forward-looking statements, which include statements about future subscriber growth and the marketing fund. Forward-looking statements are estimates and projections reflecting management’s judgment based on currently available information and involve a number of risks and uncertainties that could cause actual results to differ materially from those suggested by the forward-looking statements. All information set forth in this release is as of January 17, 2017. Sprint Corporation does not intend, and undertakes no duty, to update this information to reflect future events or circumstances. Information about certain potential factors that could affect our business and financial results and cause actual results to differ materially from those expressed or implied in any forward-looking statements are included from time to time in our filings with the Securities and Exchange Commission, including Part 1, Item 1A “Risk Factors” in our Annual Report on Form 10-K for the year ended March 31, 2016.